WARSAW, PolandThe newly renovated headquarters of Poland's National Audiovisual Institute (NInA) in Warsaw provides visitors with access to some 10,000 AV materials in its archives, collated in a hi-tech multifunctional environment. The NInA servers hold up to 5 petabytes of multimedia data (the amount equivalent to about 1 million DVDs). Such a resource deserves top class technical facilities, including audio reinforcement, and ESS Audio, HARMAN Professional's Polish distributors, were recently called in to provide it — right across the HARMAN brand portfolio. With the main technology contract awarded to Studiotech, ESS was sub-contracted to provide audio reinforcement across the entire scope of the operation, including movies, animations, documents, registrations of theatrical performances, TV and radio programs and a modern video library. 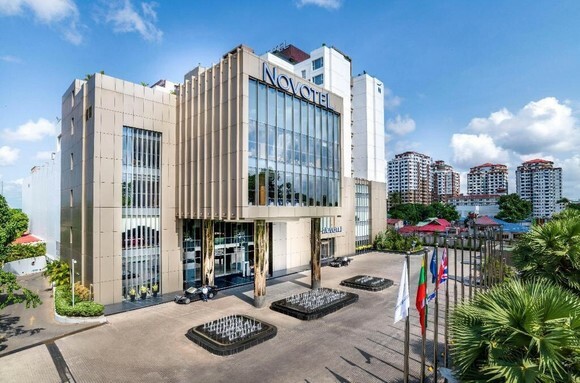 However, the key attraction is a hi-tech multifunction auditorium/cinema ready for 4K screenings, concerts, and theatre plays, along with a mediatheque with a rich collection of unique audio visual materials, and Café Gorączka (the Fever Café). To create 3D realism in the cinema, ESS has installed a 40-channel-plus Dolby Atmos cinema system, brought to life by JBL Atmos-compatible cinema components. 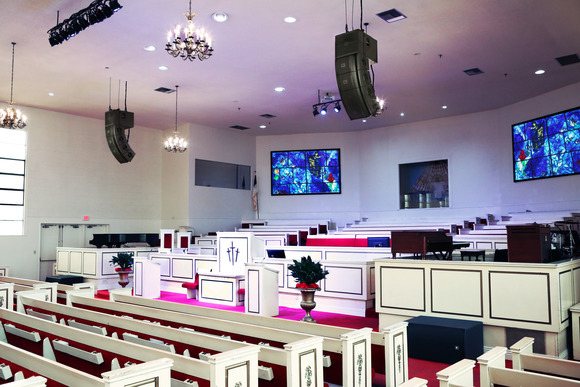 These include three JBL 4732 ScreenArrays (in a front L/C/R configuration), three 4642A (front subs), along with 24 JBL 8340A and 10 JBL 8350 on JBL surround mounts. For the rear subwoofers a pair of JBL 4645C cinema subs are used. These are powered by two Crown Macro-Tech 5000i amplifiers (subwoofers), two Crown DriveCore™Install 8I300 amplifiers (ceiling loudspeakers), two Crown XLi 3500s and eight Crown XLi 1500s. The signals for the L/C/R channels are optimized via three dbx DriveRack 260 signal processors. Playback equipment for operation when the auditorium is in 'multifunctional' mode comprises two JBL four-way Marquis MD49 loudspeakers form the FOH system, driven by a combination of Crown CTs 2000, CTs 1200 and CTs 600 amplifiers, while the two compatible JBL STX828S subs are powered by a pair of Crown Macro-Tech 9000i amps (these can be used as a portable FOH system during performances, concerts and similar events). Four bi-amped JBL VP7212MDP provide additional stage monitor options. 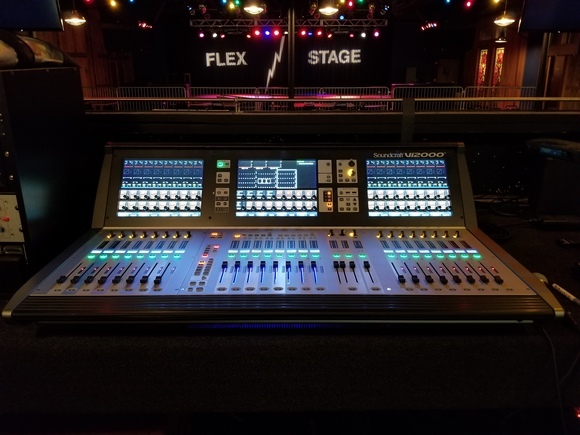 A new Soundcraft Vi3000 digital console has been specified for the FOH position, offering Dante networking, with SDI HD and MADI optical interfaces, while a Soundcraft Si Performer 1 (fitted with MADI and Dante cards) handles monitor mixes, with the FOH linked to the stage position by a Stagebox for both consoles. 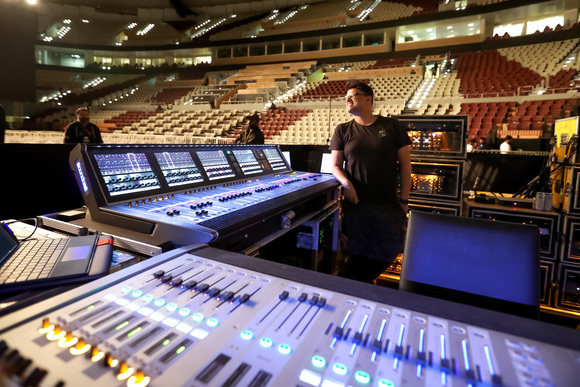 FOH signals are processed through BSS Audio Soundweb™ London BLU-102 processors, connected to the main digital audio network, which is managed through four Soundweb London BLU-806 devices with Dante connectivity. 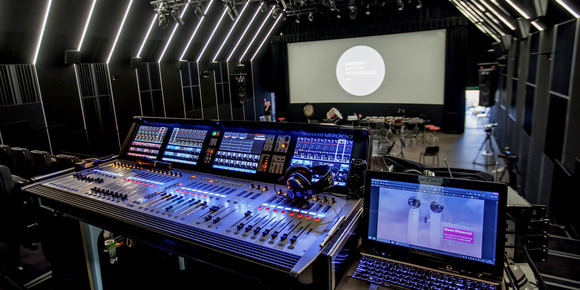 Elsewhere, the audio and screening pre-release room, where final technical corrections are executed, is equipped with a 7.1-channel system, configured with three JBL M2 monitors as front channels, plus two LSR6312SP subs, and LSR6332 monitors as surround loudspeakers. These are driven by three Crown I-Tech 5000HD and four Crown XTi 2002 amps. There are also two 7.1 sound restoration studios, each equipped with seven JBL LSR4326P monitors and LSR4312SP subwoofer. Two further digitization/archiving studios have also been equipped with two LSR4326P monitors. ESS also constructed a PA system for the corridor and ancillary areas, comprising four JBL Control 8128 on-wall speakers as an extension of the existing 100V line PA system, and eight JBL Control 23Ts in the club, NINATEKA (library of audio and video materials) and conference room. These operate in 100V Hi-Z mode, powered by three JBL CSMA 280 amps. Additionally there are eight JBL AXYS U12 loudspeakers installed in the conference room, which can be divided into two — also connected to the digital audio network. The video wall in the main room is equipped with two JBL AC16 loudspeakers, driven by a Crown CTS 600 amp and a portable SR system comprises two JBL PRX710 powered loudspeakers mounted on a JBL TRIPOD-MA adjustable speaker tripod stand. The BSS Soundweb London network is configured to allow audio signals to be sent between all spaces in the building on a large matrix that includes nine BLUCARD-In input cards, and 11 BLUCARD-Out output cards. ESS also dipped heavily into the AKG catalogue to develop an interpretation system, connected to the digital network, and based on AKG CS5 and CSX systems. These are set in three portable booths with interpreter stations that can be moved around NInA's rooms, featuring AKG CS5 IU and GN50CS+CK31 gooseneck mics. Interpretations are transmitted through AKG CSX BIR10 transmitter/interface and two IRT3 and one IRT4 infrared radiators. These comprise 120 AKG CSX IRR10 infrared receivers in the multifunctional room — one for each seat — with 150 AKG K20 headphones. As it is on the network bi-directional signals can be received from outside and transmitted through IR (and vice versa). In addition, ESS Audio provided the facility with ancillary equipment, including six AKG DMS700 wireless channels, with three handheld transmitters (D5 capsules) and three bodypacks, four each of AKG CK99L, C417L, D5, C1000S, C414XLS, P170 and P4 wired mics, as well as two JBL LSR305 studio monitors, cables, rack cases, tripods and other accessories. Other rooms are equipped with 10 JBL LSR6325P studio monitors to deliver high quality reference sound for NInA's A's Staff as they prepare new content. Finally, as a safety backup, critical data is stored independently on two storage systems, located in separate data centres, with independent security and fire alarm systems. The opening ceremony of NInA took place at the end of May, with the participation of Minister of Culture and National Heritage. Prof. MaŁgorzata Omilanowska, Mayor of Warsaw City Hanna Gronkiewicz-Waltz, NInA Chairperson, famous movie director Agnieszka Holland and NInA Director MichaŁ Merczyński.